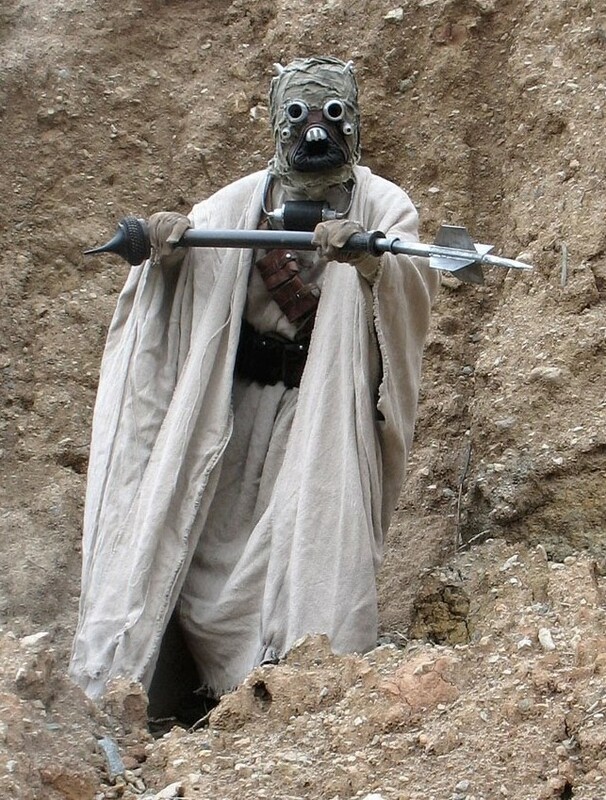 Somewhere, in a galaxy far, far away, there might be people who thrive in the midst of dust. That's not us. Dust storms here on earth can be dangerously unhealthy. Dust storms don’t just happen in the middle of Tattoine or in the Oklahoma Dust Bowl. In our state, dust is more of an issue in Eastern Washington, but can be a problem anywhere given the right (or wrong) conditions. Sand People, Star Wars: A New Hope. While agricultural lands and activities have been the primary source for dust storms in Washington, we’re seeing fewer per year, thanks to better farming practices. Dust storms have become less common in Washington since the mid-1990s when farmers started using more soil erosion prevention techniques. Those farming techniques have made a difference: In the early ’90s, Kennewick had as many as seven dust storms in just one year! Compare that to the past six years, when the area only had seven dust storms in total. That means cleaner air and healthier people. Judge by size, do you? 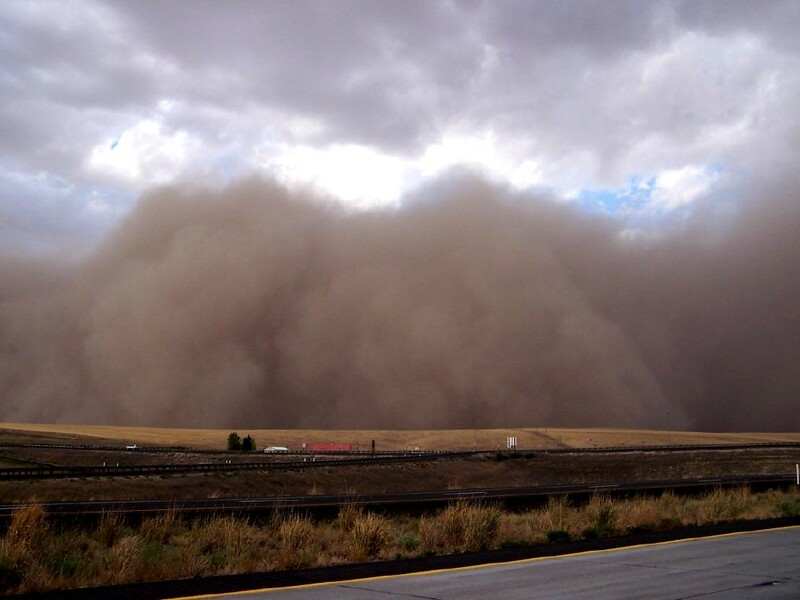 Strong winds and dry conditions cause large amounts of soil to be blown into the air. When that happens, it’s hard to see, making driving dangerous. Plus, all of those large and small particles sting your eyes and sandblast your body. The tiny particles — known as PM10 and PM2.5 — can get deep in your lungs, causing irritation and worsening existing asthma, allergies, and heart disease. Dust storm in Eastern Washington, August 2005. Ecology and our clean air partners monitor the air for dust and other pollutants. In areas where windblown dust is a problem, we work with U.S. Department of Agriculture program partners to minimize soil erosion. We’re piloting a grant project in Benton, Franklin, and Klickitat counties where dust blown from farm land causes Kennewick’s air quality to be unhealthy. The focus will be on farms in the Conservation Reserve Program — a land conservation program that pays farmers to take land out of production and maintain plants that anchor soil. As these conservation contracts expire this fall and land goes back into use for farming, the grants will support farmers’ use of farming methods that keep dirt on the ground and out of the air. When there's a dust storm, pull over if you're driving and stay in your car. Don’t exercise outside. Cover your nose and mouth. Get inside if you can and close windows, doors, and vents. Sign up for Dust Storm Alerts from the National Weather Service to find out when high winds are forecast. Dust may not sound as dangerous as other types of air pollution, but it can be just as harmful. The best way to prevent dust is to continue encouraging farmers’ efforts to find new ways and use tested methods to prevent soil erosion. Ecology and our clean air partners have made a lot of progress over the past few decades. We’re committed to protecting your health.